Everyone reading this lives in different temperatures and climates and our methods off carry are going to be different. Here in Pennsylvania we have to change our carry options at least 2 or more times a year. It’s hard to carry IWB in the winter if you are all bundled up and that’s when I consider shoulder holsters and usually paddle holsters, I often switch to a larger firearm. In the summer, when it’s t-shirt and shorts time, it’s almost always pocket carry. I got tired of having to worry about shirts printing, or body sweat building up on a firearm. We have about a 9 questions check list that we ask customers when they walk into our store and ask about holsters, you really need to have some idea what you are looking for besides comfort because there are so many options. If you just got your CCW, a good starting point are the Fobus Paddle Holsters, you’ll learn a lot the first couple weeks you carry and after that you can move on. They are usually in the $30-$40 dollar range. Always verify holster fit with the model of your firearm. We often get partial model information when we ask people what firearm they need a holster for. For example: “what gun do you have?” and the response is “a Springfield XD” and several questions later they inform us it’s and XDS. There are a ton of differing opinions amongst any Police Department regarding the Uniform gear that they were, some hate it, some love it, and some feel they don’t even need it. One of the shocking realities about many Police Officers regarding Pepper Sprays is that they usually all hate carrying because the mess and blow back that occurs and what the procedures are for an individual they used it against. Less Lethal force is just that, “less lethal” but there are still plenty of things that can go wrong. Recently there was an incident with a Bucks County Police Department where a minor that was handcuffed, fled police, and ended up being injured running away. Every time you use a device there are always things that can come back to you and having confidence in your equipment is very, very important. One of the fun things about this industry is the number of times we get called to Sponsor a Competition shoot, or we get invited out to a training event and get to watch equipment and skill being deployed. There are a million options out there for accessories, from nylon, kydex, leather or STX finishes, but Fobus Holsters offers a very inexpensive product line that “may” work for you depending on the situation you are in. I find the double magazine paddle holders to be a little too much and prefer only a holster to have a paddle on it, everything else I believe should be attached to the belt. Try putting all of your equipment on sometime and try rolling on the ground with it, would you be more likely to get hurt or would you be more likely to concentrate on the threat? There are always people pointing out the pros and cons of tactical gear because in reality, each item we accessorize on a firearm or each device we carry on our person, from knives, to flashlights has it’s designed purpose. Flashlights can be good at close ranges and put out a lot of lumens, but some of those bright flashlights are not very good for scanning out and identifying things at longer ranges. A flashlights output doesn’t mean it’s going to be light up everything. Just knowing how to flip a flashlight up on the ceiling of a room to illuminate a room, in low light can be more beneficial than just scanning around and looking under every dark spot. When it comes to choosing a holster, you have to decide what firearm you are going to carry and find the best way that suits you. Some find that picking out a holster is as complicated as getting dressed up for a date and we often have to talk them down to simplicity. One thing about selling Fobus holsters is we never have customers get sticker shock. Here is Pennsylvania its been very cold and carrying with lots of heavy clothing on can make IWB carry difficult. 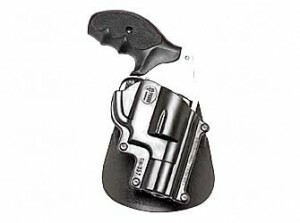 We have been selling a lot of the Fobus paddle holsters because so many people are finding out that even a small j-frame revolver can be easier to access via a paddle holster than an IWB setup. Much of the Concealed Carry world is about personal choice and our diverse product line of Don Hume gun holsters should fulfill most of our customer needs. If you are not looking for a locking holster and want something fast and easy to and comfortable to wear, try the Don Hume Jit holsters for your Glock 19, Sig 239 or whichever semi-auto or revolver you need. 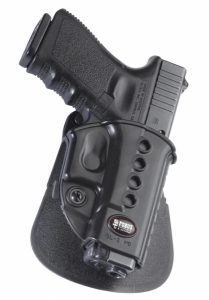 The Jit holster sits securely on your belt and sits at a very comfortable level for easy retrieval. Pocket holsters are must to avoid problems with firearms rotating and the pocket holsters will place your holster in a secure upright position and help keep lint and other nasty things a pocket can hold away from your handgun. If you’re looking for a durable, clip on holsters it’s hard to beat Don Hume holsters. Don Hume holsters in soft pocket clip on, waistband clip on with thumb break, front pocket ambidextrous, Ankle safe and much much more. Don Hume holsters are made for your concealed carry gun or duty holster needs and are made for your revolver or semi-auto. IWB is hands down the most concealed carry friendly method and the IWB clip on gun holsters are very reliable if a good gun belt is used. Pocket carry is becoming more and more the norm these days with more reliable compact semi-auto guns. The pocket protectors are a must for anyone trying to keep lint off a firearm which can affect the reliability and performance. How many options should I consider when deciding on a paddle holster? We get tons of people walking in the door hear looking for a holster that they can use for their gun with a light attached to it. The majority of the time it’s the Surefire X300 or the Streamlight TLR-1, TLR-2 or sometimes the TLR-4 light. Every police department in our area has some variation of those light either on their AR15, G36 or their handguns. There are a lot of options out there for paddle holsters and in 2014 we will be bringing in more and more of the Fobus gun holsters and the Safariland holsters. One thing we’ve learned is if you don’t have a Glock, 1911 or a Sig 229, Sig 226 or Sig 220. You are going to be limited to customer kydex or a very few manufacturers. We have a large number of customers that want something other than the Blackhawk Serpa and when it comes to light attachments, they are very limited. There are going to be big increase in the number of Safariland holsters in our inventory this year because so many CCW holders are using them because they are much sturdier than Fobus gun holsters. They are more expensive but I have yet to have someone walk in the door with a broken gun holster. Even the local State Police are buying our holsters because they have switched from the Glock 38 to the Glock 21 like many of our local Police have. New this fall we will be bringing on the Aimpoint and Fobus product lines into our 1500 sqft tactical store along with several items from Tru-Spec and Warwick Mills. We have dealt with several distributors over the last 9yrs and it’s gotten to the point that instead of waiting for stock to arrive, and have to deal with fighting over inventory from other dealers, it was time to start stocking the stuff directly. There are always changes and improvements to product lines and not getting stuck with a dud product or making sure you have the newest version of something is very important. Just this year alone we saw some major improvements to our holster and tazer product lines and LED Technology for flashlights has improved by about 85%. Sometimes holster companies don’t have the accessories up to date with the batons, flashlights, magazine pouches ect that people want. 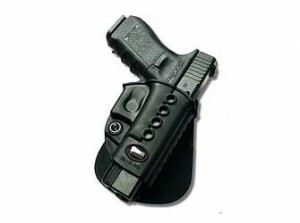 There have been situations where we have asked customers to look into getting a customer kydex holster becaues there needs were beyond what many manufacturers could make. Many of our Law Enforcement sometimes have an issue with a holster breaking and just need a quick fix for a range day and that is often where Fobus Holsters come in. I have a Fobus holster for every Glock firearm, Sig Sauer 228, 229 and Sig 220 that I own. 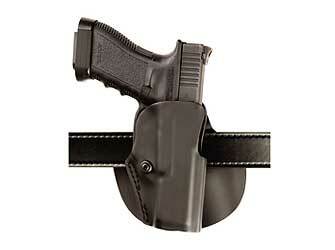 There are some retention holsters that I may look into picking up since we are a direct dealer now. The new E2 holster has more flexability when it comes to adjusting your retention which was a common complaint about some of the earlier paddle holsters. What to train with and how much money do you want to drop on a holster? I have a large number of guys that are detectives or just got hired for a job, and sometimes even first time concealed carry holders that don’t have the slightest idea of what they want. People come in here and ask me “do you have anything for a Glock 26” and point to the holsters I have thinking I’m going to point them to a holster. I then bombard them with “inside the waist” or “outside the waist” “do you want a leather or kydex?” “Righted or left handed?” It not until i start talking about which hand holster they want do they give me any sense of knowing what to say. I don’t think you can compare holster shopping to anything else because it’s not like shopping for tactical pants or gloves. With crime like home invasions and a slow economy people that have money think more about protecting their homes and assets. I think Kydex probable outsells leather now but with so many people putting lights on their guns it made shopping even harder. Our quick fix or go to problem solvers are the Elite Survival Systems holsters but gun holsters like Fobus are the starting point for the majority of our new gun or concealed carry permit holder. They are very easy to put on and work well with most belts. I do highly recommend people get a good gun belt like a Desantis leather belt, Blackhawk pistol belt or a Wilderness belt. They are much easier to use than putting on a belt through or snap on holster. Getting into retention holsters is another level but sometimes people have to have the right starting point and only an experienced shooter will be the source for good info. There are as many gun holsters out there to choose from but it’s always a good idea to have a few different style of holsters to give you more diversity in the way you can carry a firearm. Fobus holsters are designed for primary or secondary carry, they are our number one selling Competition shooting holsters and often get sold with concealment vests. 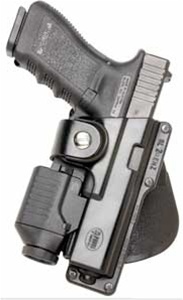 Glock Fobus holsters, Sig Fobus holsters, Beretta Fobus holsters and Springfield XD holsters. The 1911 Fobus holsters have no retention devices to disengage and make a great companion to the 1911. Recently we held a Utah CCW course in our store and several of the people showing up were very new to firearm ownership. They were completely oblivious to what type of holsters to use and we recommended starting off with the Fobus holsters like their paddle holsters. These guns are very inexpensive and are often used in our new competition or defensive training. For many medium or large frame firearms, if you are not sure if you want a customer kydex holster that costs $50 and up or you you don’t know if you want a leather holster, this is the best starting point. 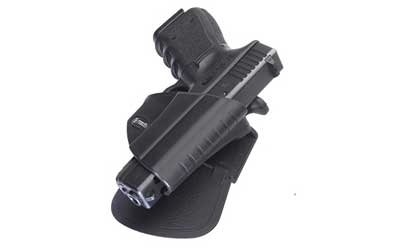 We highly recommend these holsters for concealed carry or for defensive training classes. Concealment garments like the Eotac Style 102 vest along with a Fobus paddle holster are our most popular defensive training accessories for students taking defensive concealed carry courses. They are extremely comfortable for carrying full size and medium size semi-autos and are easy to detach from the belt. For Winter or open carry use, the Fobus paddle holster is a inexpensive and long lasting tactical holster. Get a good gun belt like the Wilderness 5-stitch Instructor belt and you won’t notice the difference between a Sig 239 and a Sig 226 on your body. Fobus holsters are also very good for carrying in the winter when wearing a heavy coat is the norm. It’s always a good idea to have atleast a summer/winter configuration when carrying concealed and the Fobus holsters are something worth putting into your rotation. The quick and easy method of detaching the holster from the belt makes taking the gun holsters off and on that much less of an issue like belt loop holsters. Double and single stack magazine pouches are just as easy to take on and take off as the holsters are. There are also other concealed carry options like the Ankle Fobus holster which is one of our top 2 methods for white collar concealed carry. How useful are ammo cans? What is a Tactical Store?